Every so often (just about once a month) a good buddy of mine and I like to get together at Lost Rhino Brewing for lunch and a pint or two. It’s close to where we both work, they’ve got excellent beer and usually have great food  bring back the Chicago-style bison dog please! Yesterday, however, we decided to try something new. DelMarVa’s Southern Cafe and Taphouse recently opened in Sterling, VA a couple of weeks ago and it didn’t take long for word hit me that they had a solid selection among their 48 taps. That was more than enough motivation for the both of us. As you can see by the above photo, deciding on a brew from the likes of local favorites Devils Backbone, DC Brau, Port City, DuClaw and Legend Brewing, as well as domestic favorites from Stone Brewing, Ommegang and Avery (among others) was quite a daunting task. Well, it was tough until I noticed the handle for North Coast’s Old Rasputin Russian Imperial Stout. I wasn’t really paying attention when it was poured but it came to me looking much creamier than expected and tasting smoother as well. Apparently, the good folks at the restaurant are dispensing it similar to Guinness with a nitro-tap. Win, win! After we had settled into our glass, it was time to order. I opted for a bacon cheeseburger with a bacon marmalade (as well as lettuce, tomato and onion). 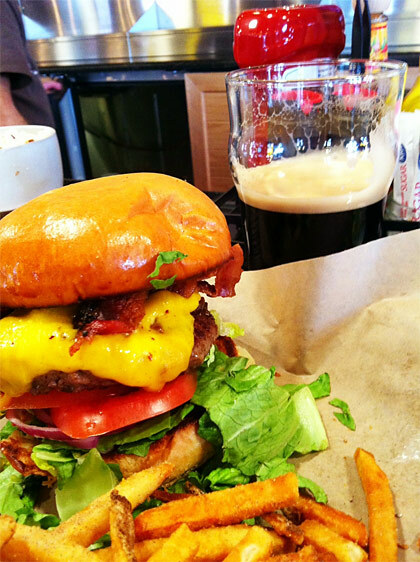 The rest of the menu looked pretty tempting, but I really do love a good burger and this one did not disappoint. Having scarfed down our lunches, we found we had a good bit of time left before we had to head our separate ways. That meant it was time for another round. I fought the urge to order another Old Rasputin and focused my direction to a local brew. I hadn’t had Devils Backbone Dark Abby before, so I took this opportunity to try it out. Despite all of the appropriate glassware that was available, the bartender brought this Belgian Dubbel in a nonic pint glass (ah well). The shape of the glass did little to alter my enjoyment of the tasty brew. Having just opened a couple of weeks ago, the place was pretty empty at lunch time as expected, but the food was good and the beer selection solid. I will certainly be coming back and hope that my meager contribution to their bottom line will keep them in business long enough for me to make it through all 48 taps. 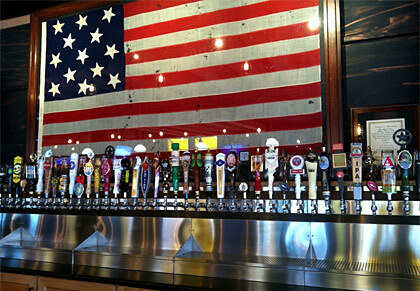 Share "DelMarVa’s Southern Cafe and Taphouse"